We use 100% cotton thread to remove unwanted hairs. With threading your therapist is able to get the ultra fine hairs that is harder to pick up with waxing or tweezing. The hair does not need to be very long, as the thread can pick up the shortest of hairs. You will not get the kind of redness you would get with waxing, because the thread does not cause any abrasions to the skin. All areas of the face can be threaded. 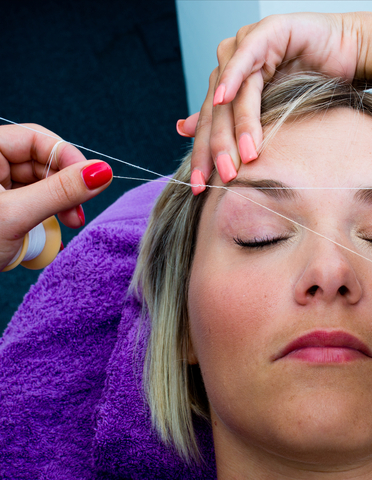 Threading is highly recommended for eyebrows as you get a more cleaner and defined shape. Due to the slim precision of the thread. We recommended for this service to be carried out every 2-3 weeks. Dependant on your hair growth. Book your threading treatment today.